This is the tallest High Cross in Ireland. W5 (?) Raised Christ / Ecce Homo / Jesus led to Annas. For further discussion see Harbison, 1992, p.150. Allen, J.R., Early Christian Symbolism in Great Britain and Ireland before the Thirteenth Century 1, , London (1887) . Allen, J.R., The Early Christian Monuments of Scotland 1, , Edinburgh (1903) . Champneys, A.C., Irish Ecclesiastical Architecture 1, , London (1910) . Cullen, L.M., The High Crosses of Ireland and the Book of Kells 1, , Dublin (c.1905) . Stokes, M., Dunraven, E., Third Earl of Notes on Irish Architecture II 1, , London (1877) . Harbison, Peter, , ‘The Inscriptions on the Cross of the Scriptures at Clonmacnois, County Offaly’. In Proceedings of the Royal Irish Academy (1979) 79C, 177-188. Haseloff, G., , ‘Irland’. In Propylaen Kunstgeschichte (1979) Supplement b and 4, 223-243. Roth, H., Propylaen Kunstgeschichte, Supplement b and IV 1, , Berlin (1979) . Henry, F., La Sculpture Irlandaise pendant les douze premiers siecles de l'ere Chrétienne 1, , Paris (1933) . Henry, F., , ‘Remarks on the Decoration of Three Irish Psalters’. In Proceedings of the Royal Irish Academy (1960) 61C, 23-40. Lucas, A.T., , ‘The West Cross, Monasterboice: a note and a suggestion’. In Journal of the County Louth Archaeological Society (1951) 12, 3, 123-125. Lucas, A.T., Treasures of Ireland. Irish Pagan and Early Christian Art 1, , Dublin (1973) . MacAlister, R.A.S., Muiredach, Abbot of Monasterboice 890-923 A.D., His Life and Suroundings 1, , Dublin (1914) . MacAlister, R.A.S., The Archaeology of Ireland 1, , London (1928) . MacAlister, R.A.S., , ‘The Panel representing the Traditio Evangelii on the Cross of Muiredach at Monasterboice’. In Journal of the Royal Society of Antiquaries of Ireland (1932) 62, 15-18. MacAlister, R.A.S., Monasterboice, Co. Louth 1, , Dundalk (1946) . MacAlister, R.A.S., Corpus Inscriptionum Insularum Celticarum II 1, , Dublin (1949) . Stokes, M. , Petrie, G. Christian Insciptions in the Irish Language II 1, , Dublin (1878) . Porter, A.K., Spanish Romanesque Sculpture I-II 1, , Firenze/Paris (1928) . Porter, A.K., The Crosses and Culture of Ireland 1, , New Haven (1931) . Richardson, H., , ‘The Concept of the High Cross’. In Irland und Europa. Die Kirche im Frühmittelalter - Ireland and Europe. The Early Church (1984) 127-134. Roe, H.M., , ‘The High Crosses of Co. Louth. A Photographic Survey with Notes on the Monuments’. In Seanchas Ardmhacha (1954) 1, 1, 101-114. Roe, H.M., , ‘Muiredach's Cross, Monasterboice’. In Ireland of the Welcomes January-February 1963 (1963) 2, 5, 17-21. Roe, H.M., , ‘Ireland and the Archangel Michael’. In Millénaire Monastique du Mont Saint-Michel III. Culte de Saint Michel et Pelerinages au Mont (1971) 481-487. Ó Danachair, C., Folk and Farm. Essays in Honour of A.T. Lucas 1, , Dublin (1976) . Roe, H.M., Monasterboice and its Monuments 1, County Louth Archaeological and Historical Society, Louth (1981) . Sexton, E.H.L., A Descriptive and Bibliographical List of Irish Figure Sculptures of the Early Christian Period 1, , Portland (1946) . Smyth, A.P., Scandinavian York and Dublin. The history and archaeology of two related Viking Kingdoms II 1, , New Jersey/Dublin (1979) . Walcha, G., Beitrage zur Bandgeflecht - Ornamentik in Schottland. 10. Veroffentl. D. Abteilung Architektur des Kunsthist 1, Inst. D. Univ. Koln, Koln (1976) . 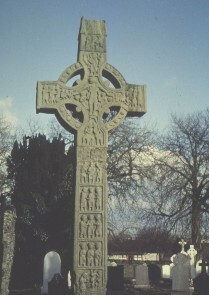 W., V., , ‘Irish Cross’. In Bulletin of the Metropolitan Museum of Art 3 (1908) 228.